what I'd like to know is if the new 2015 models (and the recently released 2014 Hybrid) all have the issue? What's not clear is whether they have already resolved it on the production/assembly line and just haven't figured out how to handle it for existing vehicles already in the field, or if they haven't figured it out at all, period, and all new models being produced still have the same defect/issue. This problem (along with the A/C moan/whine issue) is the single one thing that infuriates me most about this car. Driving it up in the burbs where I live is great. But as soon as I take her to the city for work every day, I literally dread driving my car anywhere downtown it's that bad. Even my wife has gotten to the point where she think it's ridiculous considering how much I pay for this car monthly. She constantly says how her ILX handles way better in the city - and it does. If this defect has been corrected in current production, all they need to do is release the revised parts with installation instructions for any vehicles in transit, on dealer lots and already sold. Child's play. Based on the available information, my assumption is this defect has not been corrected in production or in the field. They are still investigating, testing, etc. Sorry to read of continuing troubles. Here's to Acura getting it right. Engineering is not an exact science, after all, though you would think it was. All the above would be true "if Honda/Acura built and assembled the strut and not a Sub Vendor. I know how frustrating these problems can be, especially when your not receiving any communications from both Honda/Acura engineering or the vendor. I would almost assume that the reason we are not hearing a peep is because this is not high enough on the priority listing, especially when these may be the same parts being installed on the newer models. I think in the mind of Corporate management, priority goes to where the money lies and that is in the sale of new vehicles. everything else is handled thru "Warranty" and a different Budget. Currently at 33.1K and happy as a lark. Last edited by victorber; 09-15-2014 at 05:11 PM. Glad your issue was fixed, but it is definitely not the same as the suspension clunk, rattle and vibration. Had my '14 RLX Tech rechecked yesterday for suspension rattles. Same answer; " vehicle operating as designed. " The good news is that the town repaved my road this summer so i won't have to listen to the rattle every time I leave home this winter. Other problems popping up after one year. I guess I have to look for another thread for those. The only "fix " that has been applied to the suspension was the bolt replacement recall last December. The phrase "vehicle operating as designed" is used frequently by this dealer's service department. They probably have an F key programmed for it. It is noteworthy that 6 months or more after being informed by acura that a permanent corrective action involving revised suspension parts had been developed, was in the final testing phase and would be released in "a month or two", there is still no fix. The clunk and rattle in my car seems to be getting progressively worse. The preliminary court date in my lemon law case filed for this defect is in about 10 days. In a month it will be one year since I took delivery of my rlx, which has had this condition since day one. Shame and not good press for Acura. I am surprise that Acura let it go this far, a court appearance. I brought a new 2013 Toyota Avalon Limited w/tech a few years back and in the first month of ownership I had it in the shop for 15 days for multiple repairs. Headliner fell down, magazine holder on the back of front seats pop off, steering wheel had a bubble on it. They fix everything then the headliner fell down again and the Sat Radio went out. I sent a letter to the president of the America company and to my surprise they assigned a person to it. I told them I buy new cars because i don't want other people problem and I did not feel comfortable with this car. After a few discussion they offered to give me my money back or give me a new car. I choice the new car and since it was late in the year they gave me a 2014. This instill brand loyalty, I am surprised Acura does not use the same approach considering most Acura buyer are repeat business and there are a limited number of them. You are absolutely right. I appealed to the highest levels of Honda/acura for assistance. I also discussed the matter personally with the owner of the dealership. All to no avail. This, after having leased 4 TLs and having owned probably 6-8 Hondas. The dealer and acura have stated clearly that my car and all 2014 RLXs are defective. Yet some dealers continue to tell owners that the car "functions as designed". The only response to this is: then the design is defective. My request that they give me any acura other than an RLX as a loaner until the issue is resolved was rejected. This is how my brand loyalty has been rewarded. Glad to hear your experience with Toyota was so much better. This is only my speculation. I have read and been told by my Acura contacts that there are issues with shocks / struts / dampers across several models. I read that with other brands as well. It is possible the design is not flawed as much as the part itself not performing to spec. It is a thin line between sounding crappy as opposed to not getting the job done (although I would be manic if I has a clunky new car). I read this most with the RDX, ILX and MDX. If the high volume TLX reveals the same, God help Acura as the TLX community is the most vocal and emotional of the brand. It is possible Acura is in mitigation with the strut supplier and supply contracts are binding. Still, the consumer should not be forced to bear it out. Second, we have not enough data but in the RLX case, I strongly suspect the suspension was tuned for the SH RLX. From my one day SH experience, it seems to behave better than in the PAWS RLX (extra weight, better weight distribution etc). Hopefully we will get some feedback on this from George (or local PWS to SH) guinea pig. Acura can blow this too. As it may likely not turn out to be a recall issue, more a TSB issue. But the number of owners claiming of clunky Acuras will not bode well in general reputation. For those who press it as firmly as you are maglebr22 (and I applaud you) it will bear Acura's true colors if they continue to sweep it under the carpet. I agree that the suspension seems to come into its own with the Sports Hybrid, but for all we know the Sports Hybrid has different dampers, bushings, or even springs. My P-AWS car did not have the difficulty being described. It was made in August 2013, and my Sports Hybrid was made in January 2014. Doesn't Honda own enough of Showa that they would have a real power to bring to bear if something needs to be changed? When I asked if there were any unique suspension tweeks for the SH, the Acura rep on my SH drive he said 'no'. However I have yet to find published part numbers to compare between PAWS and SH. Perhaps a tech on the board might check the part #s and advise? Thanks for your kind and encouraging words on my efforts to hold acura accountable for this defect. I agree it would be interesting to know whether the 2014 rlx, the 2015 rlx and the 2014/2015 rlx hybrids all share the same part numbers and suffixes for the struts/dampers. If there has been no engineering change since the '14 rlx paws version, that would seem to confirm that acura has yet to determine the root cause of the defect and implement a change in design, material, assembly process, etc. Since I have yet to read any complaints about the rattle and clunk on the hybrid, my guess is something has been changed-or perhaps that version began its design life with a different strut design and /or supplier. The first paragraph in the abstract sure seems to describe the RLX suspension noise problem in this thread and the root cause. The authors of the paper call it the 'loose lumber' noise. Importantly, the authors say that the noise sounds like a loose bolt/component, but is in fact noise from the shock itself. And the noise on the RLX does n fact sound like a loose bolt/rattle. And the SAE also references other papers with similar subject matter, but not all are available to view without a fee. Page 2 of the paper - under 'problem definition' also seems to match the problem on the RLX. And just under 'Figure 5' the authors compare 'bad shock' noise and 'good shock' noise - meaning,,, well,,, not all shocks/dampers go clunk. And 'Figure 8' describes how almost all of the shock noise gets transferred to the car chassis via the top shock piston rod mount - which on the RLX is just under that rubber cap at the top of the wheel well area as viewed with the open hood. I was first chasing a 'loose component' path to try to find the RLX rattle/noise - brake pads, sway bar mounts, etc. Instead, it can be, and likely is, the damper/shock that is actually causing the noise. And the paper is consistent with other observations and comments in this thread about possible corrective actions. Wow - Ken, that has to be probably the single most important piece of evidence confirming the issue. The description is absolutely spot on. What's interesting is that for the first year of my RLX ownership, it was never a real issue for me due to the majority of the road conditions in where I live (North Atlanta) being really good. And on really good roads, the RLX is a dream ride. Only but a handful of times did I notice what people had previously reported. But after taking a new job with a new company in Midtown and driving into the city every day for work, Oh My God....it was insane how quickly I realized how bad the suspension issue really is. Even my wife has commented as to what the hell is up with my car when we drive into the city (she drives our 2013 ILX daily and it's much much better than the RLX). And I'm not trying to be sensational here. I cringe driving my car in to the inner-city, cause it just feels like the car is going to break over what should be otherwise just bumpy inner-city roads. The description of the loose/bolt component sound is dead one. The car just rattles and shakes like the entire body is not properly bolted together. Which is further confirmed by the article where it talks about how the car chassis takes the brunt of the noise transfer from the suspension, further reinforcing the general clumsiness and noisy/rattle behavior of the car when driving over less than perfect road conditions. Acura really needs to quit the BS and step up and properly acknowledge this issue with it's existing RLX owners. Even if they don't have an answer or fix yet, at least properly acknowledging it with their dealerships, sales reps, and customers goes a long way in keeping our trust. This has become the single most disappointing component of my experience with the RLX so far. Everything else I've complained about previously are minor annoyances and things I consider more based on my personal preferences/wants/desires. But this is clearly a product quality issue of which should NOT be exhibited on a car of this price and position in their product line-up. This is the type of stuff that doesn't leave me sitting well based on the amount of money I spend on their products and makes me want to move to another brand. 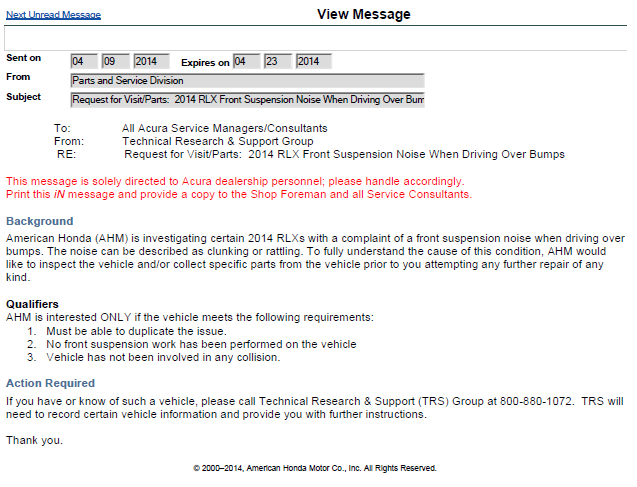 Acura has been aware of this issue since at least 4/9/2014, per this email to dealers. That should be reflected in the settlement between yourself and the insurance company of the person that hit you. You weren't at fault and all the damages that you suffered or will suffer should be addressed before you settle. I'm the least litigious person on earth, but innocent drivers should NOT suffer financial loss because of negligent drivers. yes, you're right hondamore. the point I was making is that they probably would not want to use my car as a "test" specimen since it no longer represents a "clean" unit that is still intact from factory spec. The collision has now introduce potential variables that may prevent them from identifying the real root cause of the issue. It's the same reason they stated bullet #2, which indicates they don't want vehicles that have had service attempted on fixing the suspension issue because it too has now introduce potential variables as well. I had this thread in mind with my hybrid test drive last night and I made sure to drive the car over at least one bumpy road. I didn't hear the clunking. Correct. They have been aware of it since April-and well before. Notwithstanding what dealers continue to tell customers, they informed me during the arbitration hearing last summer that they had "definitely" identified the root cause of the defect present in "every '14 RLX "(the exact nature of which they refused to share with me, other than to say the location of the problem is the dampers). They also stated that the permanent corrective action had been determined, that revised parts had completed and passed acura testing and that "additional" usdot/nhtsa testing was in process, after which the new parts would be released to dealers "in a month or two". The fact that this has not happened and there has been no further update or communication on this matter is why I elected to proceed with the lemon law suit. By the way, the rattle and clunk comes from all four corners, not just the front, as suggested in the memo. Thanks for your continued diligence. That helps all of us. See TSB 14-040 - Front Suspension Clunk or Rattle When Driving Over Bumps in the TSB sticky thread. I am glad they owned up to it, found a solution and rolled it out. It's an expensive fix that shows commitment to quality and customer satisfaction. Thanks for alerting us to this tsb released 11/5/14. Most importantly, what about the rattle and clunk coming from the rear suspension? I would say in my car it is as bad- if not worse-than the front rattle. Are they going to release a separate tsb for the rear, along with a different repair kit? Second, what has changed in the design and/or material in the front spring/damper assembly? Are the repair parts designated by an engineering part number or suffix change, or are they simply replacing what are deemed to be "defective" parts with "good" parts without a part number change? If anyone has the ability to check the part numbers of the replacement parts and compare them to the original parts, that would be potentially useful info. Also, if anyone has already had this repair done, please post the results and whether the dealer applied the same "fix" to the rear. Agreed! I woke up to this great update. I am scheduling an appointment to have my RLX checked thoroughly by my trusted service center (Acura Carland) for quality control on the recent repair work and will be requesting this (and the 12volt TSB) to be done. I'll report my finding ASAP. I hope you don't encounter too much resistance, but you might. It is expensive as far as TSB go, and I suspect the service manager is going to have to talk to two other people before he can do it. But if the klunk's there, it's there. It should be obvious. I can't tell you how relieved I am that they've done this. My heart sank when I started hearing about it, and the people talking about it seemed overtly normal, regular, everyday people whom we had no reason to doubt. 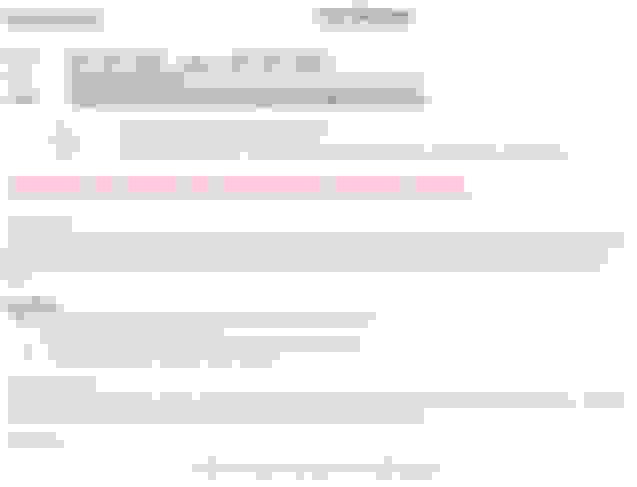 holographique, did your report the issue to your service manager before the wreck? That may leverage the TSB as it was documented before the wreck and they are less likely to dismiss applying the TSB because of the wreck. You guys bring up a good point that they may try to deviate from applying the TSB due to the recent accident. What I can say is that since there was no frame damage, I would like to think that would provide some leverage that the issue was not caused by the accident. But hard to say for sure. I'm scheduled to bring it in next Friday, so I'll post an update once things progress from there. I think it's also important to note the TSB is for "all 2014 models", which in my mind indicates its a known issue on every vehicle out there and its part of warranty. I was told my warranty was not effected by the accident and that all repair work was covered under lifetime warranty. So from my standpoint, either way you look at it, it should be fixed, whether that's through the TSB via my existing warranty or via the insurance company repairs (should they want to go the route of saying it was caused by the accident). As a rule, I always have my Service Advisor document any behavioral issues for the record. They usually respond with the typical 'cannot reproduce' but it is then on record. Should the condition worsen, or fail one hour after the warranty expires, there is a record. I have had issues rectified because of that history and more than one 'good faith' repair done after warranty by this practice. Dealers get paid by the manufacturer for most warranty and TSB repairs, so it having those records allows them to press the manufacturer and please their customer. A win - win for both. I wish this were a re-call and not just a TSB. Trying to get Acura to do this work is going to be next to impossible..
My dealership gave me the "that's normal" response when I complained my RLX, traveling over the same road at the same speed as my other two cars, made horrible noises compared to the other two. Oh, and apparently I have no wind noise problem either...mind you they never went more than 45 mph! I called my dealer this am to request an appt. he had to look for the tsb and called me back to say that it is not even released in the acura system, but he was able to verify that the tsb existed. So, for now, no appt and no action. Also, I pointed out that the clunk and rattle comes equally loud or louder from the rear suspension as well as the front and asked whether a separate tsb will address this. No repsonse to this question. Again, would be interesting to know whether the parts in the tsb repair kit are different from the original parts in part number and design. If not, my confidence that this will correct the defect is minimal. Further, I agree that this should be a recall. How can acura or owners be certain there is no safety risk if corrected parts are not installed? The springs/dampers are a structural part of the vehicle. To those with RLX Hybrid: Do you have the suspension rattle? If so, how long after you got the car did the noise start? It is a TSB advisory, not a recall. They won't notify you. I do not have any rattle on my car made in January 2014. But I also had no rattle in my previous RLX made August 2013.